Rabbits are very good animals that can certainly give their owners much joy and fun. But do you know that rabbits can also be a good source of additional income? Yes, these furry pets can actually be sold and supply you with money. Learn how to go about commercial rabbit farming and be more successful in your endeavour. Although there are some exceptions, small scale rabbit farming or even that which is not really small, is very much possible no matter on what place you will live in. commercial rabbit farming is something that you can actually try your luck with. The first thing that you need to do is to have one buck and then two does. As for your buck, there is a need for a cage. This usually measures 20 up to 30 inches. You can put the door on either long or short. This will actually depend on the available space that you have. For your does, you have to have two cages with a measurement of 36 by 30 inches. The first cage will be the staying place of your doe and the litter until they reach six weeks old. By this time, you can expect that the cage will already be crowded so it will be much better if the second place can house 8 kits, up until they are ready to be marketed. There are outdoor systems which simply let the manure of the rabbit to reach the ground. This should be shovelled before these piles get larger. See to it that things are still kept clean so that there will be no problems that can be encountered when it comes to cleanliness. Starting this kind of business is not actually very expensive. Basically, what you need are bucks and does and a good shelter, a wire cage with holes that are big enough so that the tidiness of the place will be maintained. See to it that your cage has compartments wherein each compartment can house two rabbits so that possible injuries can be avoided. What comprises commercial rabbit farming? Rabbits are very useful in many ways, basically for their meat, wool and of course fur. Rabbits are also being used as specimens in many laboratories these days. The determinant of how they will be used will depend on their breeds. Therefore, you start with a far of your own, it is a must that you as an aspiring rabbit breeder will know as to who should be the potential buyers of the rabbits. Will you sell them to restaurants, individual purchasers, meat shops, laboratories, shops, hospitals or to the breeders? You can actually advertise your business in journals dedicated to rabbit farming, farm periodicals, association directories on rabbit or even through being a participant of rabbit exhibits. Hi, I am interested in making a commercial rabbit farm in Ontario, how is it possible to raise rabbit in natural condition. i have a rabbit farm of my own in raipur-city , chattissgarh-state,country-india. And i want to sell my rabbits everywhere as required, please send buyers,sellers,suppliers and brokers contacts to me. 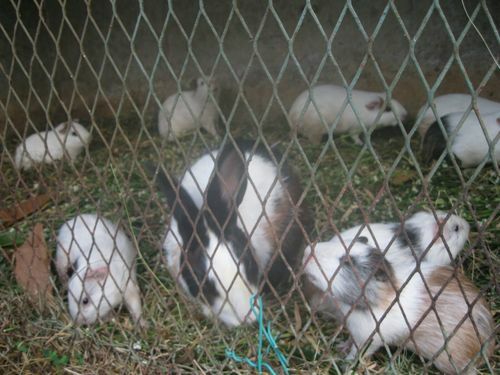 Hi, I am interested in making a commercial rabbit farm in birbhum,west bengal,india. how is it possible to raise rabbit in natural condition. and what is the procedure to collect premition of state govt. and many others. hi and hello, am interested to start rabbit farming in a commercial way pl send me the books and cd's regarding the same to my address: rajesh.m.kakaraddi,s/o m.p.kakaraddi, amogha nursing home,2nd cross,3rd main,parvathi nagar, BELLARY-583101,KARNATAKA,INDIA. (M) +919448753372. I Mr Kaushik Saha live in Kolkata , I would like to inquire about the overall procedure of starting a commercial rabbit farm , the markets where the demand of different products produced by this farm are highest and income that can be generated . @KAUSHIK SAHA, I am setting up a commercial rabbit farm in West Bengal in March 2014. The market has yet not grown in West Bengal for Rabbit meat. There is a huge scope to develop the meat market. There are some rabbit meat processing plants in South India (TN, Kerala). They purchase rabbits in bulk. If we can produce rabbit in good quantity, surely there will be some brokers inflow in West Bengal for purchasing rabbits. But the Bengalis relish rabbit meat too. If you contact with some rabbit breeders of some distant states they will sell the breeds to you and they may purchase the produce (@150/-) at present rate if you wish. i am from bolpur, dist birbhum, westbengal India. Where i sell my rabbits? Is there any rabbit meat processing centre in west bengal? Interested in commercial rabbits in Uganda kampala.